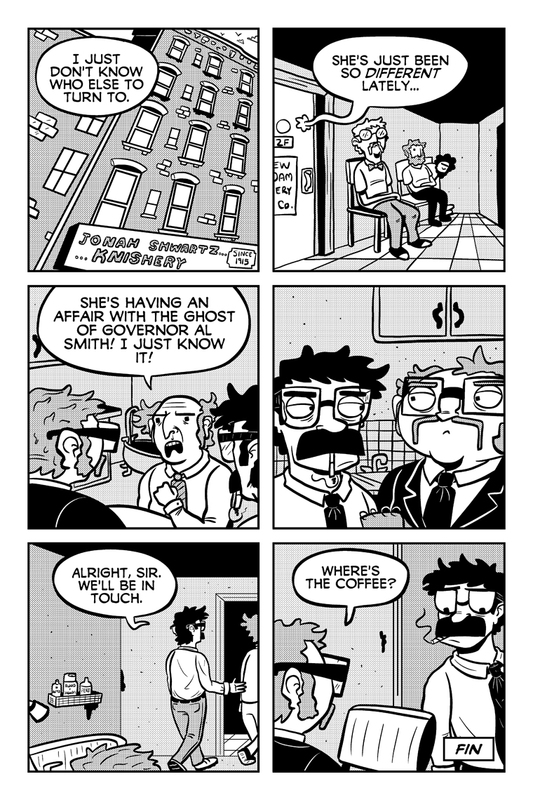 New Amsterdam Mystery Company - A comic about mysteries, and the companies that solve them. Hope you enjoyed the story – this is going to be the last update for a while! Jaya and I have some other projects that we need to devote some time to and so we’ll be taking some time off from NAMCo. We appreciate all the readers and support so far, and hopefully we’ll be back with more stories when we get some more free time. We’ll have a book and an e-book of Judicial Vacancy for sale soon. Keep up with us (Matt, Jaya) on twitter for further updates, and maybe check out our other stuff in the meantime. See you soon! Update: JUDICIAL VACANCY is now available in print or e-book!